"Lushly textured pencil drawings capture the mystery, surprise, and anticipation of . . . the most magical night of the year." PUBLISHERS WEEKLY Once upon a time, children imagined St. Nicholas as a stern, skinny bishop who was as likely to dole out discipline as Christmas presents. But thanks to the anonymous publication of the poem "Account of a Visit from St. Nicholas" in the TROY SENTINAL in 1823, a plumper, merrier St. Nick was born, transformed into the sleigh-riding, chimney-diving, jolly old elf we now call Santa Claus. 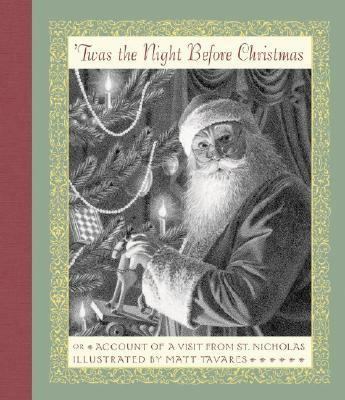 Complemented by gorgeous monochrome illustrations that are meticulously true to pre-Victorian times, this definitive volume of 'TWAS THE NIGHT BEFORE CHRISTMAS, honoring the poem's original language, is now available in a compact gift edition.Tavares, Matt is the author of 'Twas the Night Before Christmas Or Account of a Visit from St. Nicholas', published 2006 under ISBN 9780763631185 and ISBN 0763631183.